a synthetic steroid antiinflammatory agent used for various conditions, including collagen diseases and allergic states; it is also used for replacement therapy in adrenal insufficiency and in a screening test for the diagnosis of cushing's syndrome. Unclear. Reduces inflammation by suppressing polymorphonuclear leukocyte migration, reversing increased capillary permeability, and stabilizing leukocyte lysosomal membranes. Also suppresses immune response (by reducing lymphatic activity), stimulates bone marrow, and promotes protein, fat, and carbohydrate metabolism. Adults: 0.75 to 9 mg/day (dexamethasone) P.O. as a single dose or in divided doses; in severe cases, much higher dosages may be needed. Dosage requirements vary and must be individualized based on disease and patient response. Adults: Initially, 10 mg (sodium phosphate) I.V., followed by 4 mg I.M. q 6 hours. Then reduce dosage gradually over 5 to 7 days. • Give P.O. dose with food or milk. • When giving I.M., inject deep into gluteal muscle; rotate sites as needed. • For I.V. use, drug may be given undiluted as a single dose over 1 minute or added to dextrose or I.V. saline solutions and given as an intermittent infusion at prescribed rate. • Monitor blood glucose level closely in diabetic patients receiving drug orally. • Monitor hemoglobin and potassium levels. • Assess for occult blood loss. ☞ In long-term therapy, never discontinue drug abruptly. Dosage must be tapered gradually. 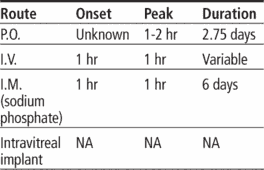 • Monitor patient for increased IOP after intravitreal injection. ☞ Instruct patient to immediately report sudden weight gain, swelling of face or limbs, excessive nervousness or sleep disturbances, excessive body hair growth, vision changes, difficulty breathing, muscle weakness, persistent abdominal pain, or change in stool color. • Tell patient to take oral drug with or after meals. • Advise patient to report vision changes and if eye becomes red, sensitive to light, or painful after intravitreal implant, to promptly report this to ophthalmologist. • Inform patient that drug makes him more susceptible to infection. Advise him to avoid crowds and exposure to illness. A potent synthetic analogue of cortisol, with similar biologic action; used as an antiinflammatory agent and as a test material for adrenal cortical function. /dex·a·meth·a·sone/ (dek″sah-meth´ah-sōn) a synthetic glucocorticoid used primarily as an antiinflammatory in various conditions, including collagen diseases and allergic states; it is the basis of a screening test in the diagnosis of Cushing's syndrome; used also as the acetate or sodium phosphate salt. A synthetic glucocorticoid used to treat inflammatory disorders. a long-acting synthetic adrenocorticoid with intense antiinflammatory activity and mineralocorticoid activity. indications It is prescribed topically and systemically in the treatment of inflammatory conditions. contraindications Systemic fungal infections or known hypersensitivity to this drug prohibits its use. adverse effects Among the more serious adverse reactions are GI, endocrine, neurological, fluid, and electrolyte disturbances. A synthetic CORTICOSTEROID drug used for its anti-inflammatory action and for its value in reducing OEDEMA of the brain. It is also used to treat severe inflammatory and allergic disorders, shock, congenital adrenal hyperplasia, vomiting caused by chemotherapy, and for the diagnosis of Cushing's disease. The drug is on the WHO official list. Brand names are Decadron and Dexsol. The drug is also used in various combinations. the group of corticosteroid hormones (mainly cortisol syn hydrocortisone, of which cortisone is the precursor) produced by the adrenal cortex, under the control of adrenocorticotrophic hormone (ACTH) from the anterior pituitary. Their major actions on nutrient metabolism have the net effect of promoting glucose and free fatty acid availability as fuels. Also vital for normal cellular processes as diverse, for example, as excitation-contraction coupling and the health of connective tissues. Synthetic steroids such as prednisolone and dexamethasone have similar actions and are used in the treatment of, for example, asthma and rheumatic conditions. Banned in sport due to their powerful anti-inflammatory action and effect of producing euphoria and masking pain. (Not to be confused with anabolic steroids). See also adrenal glands, hormones; Table 1. Potent synthetic analogue of cortisol, with similar action; used as an antiinflammatory and to test for adrenal cortical function. a synthetic glucocorticoid used primarily as an anti-inflammatory agent in various conditions, including autoimmune diseases, hypersensitivity reactions and shock; it is also used in a screening test for the diagnosis of cushing's syndrome, and for the termination of pregnancy in cattle. the determination of blood cortisol levels before and after administration of dexamethasone assists in diagnosing Cushing's syndrome and identifying the cause, depending on the protocol and dose used. Dexamethasone suppresses pituitary secretion of ACTH in normal animals and therefore the blood level of cortisol is decreased; low doses do not suppress cortisol levels in dogs with pituitary-dependent Cushing's syndrome, high doses do. Cortisol production by functional adrenal tumors is not affected by dexamethasone.